Jean-Marc Weill defines himself as a mere passeur. Yet since I’ve known him for years, I can say he excels at passing on his passion for Shiatsu and oriental medicine. A polyglot teacher and educational director of the Shiatsu school in French Guiana, he works in Paris, travels the world and Europe and does a fundamental work for therapeutic Shiatsu. 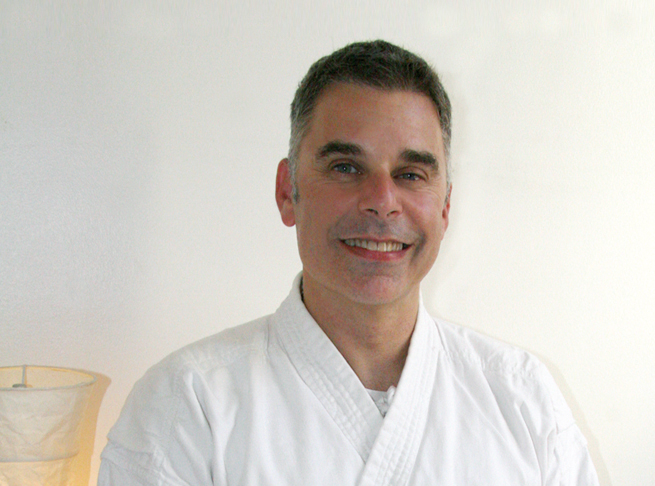 He makes Chinese Medicine accessible to improve the level of both students and practitioners. Besides, he also teaches sophrology and he is the vice-president of the UFPST (French Union of Therapeutic Shiatsu Professionals). As you will have understood, this man is someone both passionate and fascinating. Ivan Bel: Jean-Marc, to begin with and to keep it simple, where are you from? Jean-Marc Weill: I have Alsatian background, my family changed of nationality several times from Prussia to Germany then France, to finally end up in Jura near Switzerland. There is a tradition in my family: one is a doctor from father to son, including my uncles, my grandfathers – oh no, I had a great-grandfather who was rabbi – all of them except me. When came the time to make my choice, I did not follow the family path. Was Shiatsu your choice from the start? Not at all. I have had a varied life. I was a dancer for about 15 years, then at around 19 years old I went back to university where I studied finance and business law for a Master (DESS at Paris-Dauphine University). Later I worked in cultural management under Jack Lang’s Ministry of Culture. Then I created a communication company around cultural affairs. I ended this activity in 2000. Meanwhile I had already started my path getting familiar with the body, especially with Sophrology and Shiatsu. I guess the “family virus” of helping was already itching me. How did you learn about Shiatsu and who was your first teacher? In the 80s, when I was a dancer, I toured Japan and that’s when I received my first Shiatsu. When I left “the business world” as we say, this memory came back to me. I started my training with a school run by a man named André Nahum. It was an interesting school because there were classes every day of the week, all year long except for New Year’s Day. Besides we could restart any class we wanted. It was great but in the end I realized that I had a lot of intellectual knowledge but I did not know much about Shiatsu practice. Most of us come to the same conclusion at the end of the basic cursus. This awareness leads us to take further studies. So, from this observation, what did you do? At that point, I didn’t know much about anything. Basically I knew the protocol but I felt myself prisoner of the pre-established protocols. We had a protocol for headache, another for back pain and so on. But above all, I wanted to understand what I was doing, so I followed the curriculum of an acupuncture school (Quimetao Institute), with a Chinese doctor from Paris, Dr. Jian, who is best known for his Qi Gong and Tai Chi classes because he is a trainer for trainers. There, I followed the three years of full-time training near Montparnasse, with the objective not to do acupuncture – I have never done so – but to have a solid foundation for practicing Shiatsu. It helped me a lot and learning directly from a Chinese person really pleased me. I learned the Chinese way (that is to say, the precision and beauty of the gesture before the intellectual content) beside there was also therapeutic tuina massage. According to you, this basics in Chinese Medicine is essential for shiatsushi or not? I would say there are two broad categories of people who do Shiatsu. There are those who need intellectual bases and strong foundations before practicing with their clients – of which I am a part – and then there are people who are very good at Shiatsu, who use intuition and sensations and who do not want to get into the theory too much. So both ways are fine. That said, I can tell from my experience as I have had many colleagues who belonged to the second category, that a gradual weariness often appears because the lack of meaning occurs. In the end, this type of therapist ends up looking for meaning in his practice and his technique, and the meaning goes through a minimum of oriental medicine theory. So yes, it’s part of any shiatsushi’s job to know where he’s coming from and why he’s doing things one way or the other. Shiatsu is therefore a technique that is both sensitive and intellectual. How can we combine the two aspects in everyday practice? During the session of Shiatsu we don’t think and we don’t intellectualize, we live the circulation of Ki: it is a nonverbal dialogue between two humans, an alliance without ego. The sum of the theoretical information rises in us and mixes with our sensations to allow a more precise dialogue. Such sensation, considering the thousands of hours of practice, makes us think of such imbalance: maybe it corresponds to a reality or maybe not, it is the receiver who answers us.The intellectual side emerges again at the end of the session when comes the time of the synthesis, but barely at the beginning of the session, to avoid embarking on preconceived paths. Anyway, if everything went into the boxes of the theory, it would be so simple … but the human being is complex and that is all its interest. At some point in your apprenticeship, you were in New York? Why? I ended up there by episode, because my second Shiatsu school follows my meeting with Ohashi. I did all of his training thanks to him and the instructors he trained in Europe. When I decided to become an instructor myself, I had to do part of my training with him in New York, because that’s where he lives. He also often came to visit me during his frequent travels in Europe. Moreover, I was his translator in France and Italy for years. It allowed me to live closer to Ohashi and when you are in Master’s proximity, it allows you to learn directly from him and learn some secret tricks that are not taught otherwise. Ha ha, that’s interesting! Could you give us some examples? Ha, ha, I will not give them to you (laughs), they belong to him, you could ask him directly and maybe he will give you some of them? In the end, it has been a lot of training for you? It’s been many years of training, a dozen, to which I must add my practice in Sophrology. So yes, that’s a lot, but what happiness! And yet it’s never over because teaching is learning even more, constantly. 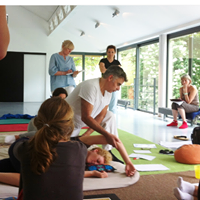 Nowadays you go all over the world to teach, what trend do you see in the practice of Shiatsu? My observation with regards to the dozens and dozens of students I meet everywhere is that people want to learn quickly, and earn a living through it too quickly. With this work, this manual art is not possible. It must be understood that when you finish school, you are just a beginner. It is only over the years of practice and training that we give that we can start to progress. After all, there are two ways of seeing things in Shiatsu. First a path that is based on well-being, and why not indeed! There’s a need for it and that’s a very good thing. Yet this way of doing things remains rather superficial, without basic knowledge. This practice doesn’t imply an immediate use of knowledge, the knowledge is built and resonates with practice and comes back in due time a few years later when we are faced to real difficulties. As a result, the second path is more oriented towards therapeutics and that’s why I like to bring input that will allow practitioners to move from one level to another, from one path to another. 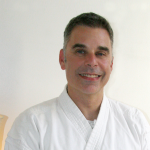 Jean-Marc, you are vice-president of the UFPST which is a therapeutic branch of Shiatsu. What does it mean to you? Indeed, it means a lot to me. To start with, the general public doesn’t necessarily have a precise idea of ​​what Shiatsu is. It is often thought as a wellness massage which would imply that the Shiatsu practitioner would not intervene in the field of health. For me, Shiatsu’s main aim is to solve health problems and sustaining this discourse and being able to prove it is one of the goals that gives meaning both to my practice and my teaching. Hence my investment in the UFPST. Last question of this interview, is there a message you would like to convey to our readers? Oh yes, absolutely! I have a message to all students, colleagues and teachers: I think we must stop comparing Shiatsu styles and ways to do it! There are many different Shiatsu styles. Each one has its role to play, each one adds an interesting approach and each one brings techniques to complement each other. We must not have value judgement in our work nor our teaching because we have a lot to learn from all techniques, styles and from everyone. I often have heard a teacher or practitioner say that such and such style has no interest because they do it differently. This speech must really disappear. Shiatsu is a Japanese art, it’s true, but it also exists in many other Eastern countries and all bring an approach with various enriching visions. In Japan, where Shiatsu was born, there is a way of practicing and moving the body but in Vietnam it’s different, in Korea it is also something else, not to mention China and each technique brings us a broader view. So we must stop the bickering, open to the world, otherwise the path we follow has no interest for ourselves nor for the Shiatsu family in general.